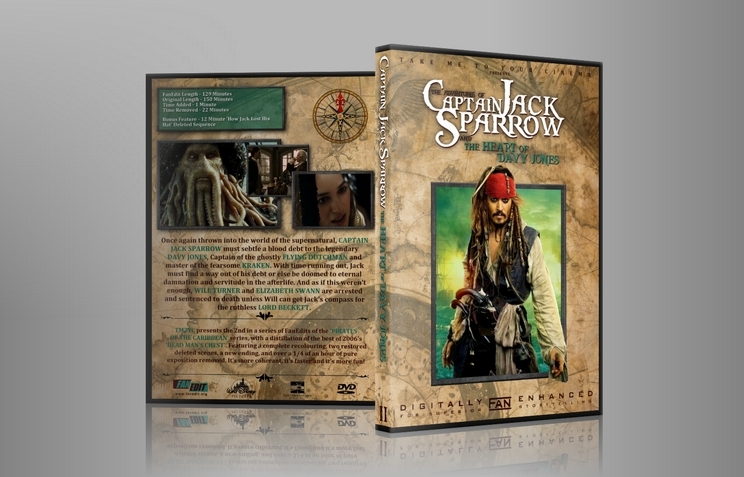 The second exciting adventure of Captain Jack Sparrow! I've never really been able to enjoy the POTC series like other clearly do as I find them overlong, confusing and self indulgent. But when they are good they offer an incredible cartoon adventure ride. So I'm going to be tackling all 4 films making the fun as exciting as possible. I've renamed the series '(The adventures of) Captain Jack Sparrow' because really that's who everyone comes to the party to see (Plus it's a reference to a certain Mr Jones). I've renamed DMC 'The Heart of Davy Jones' as I didn't think 'Dead Man's Chest' was a particulaly interesting title for an adventure romp. Also the film has been recoloured, boring exposition scenes have been slashed, scene have been reordered to flow better, Two deleted scenes have been restored, a new ending has been created and Will and Elizabeth don't now fall out. 02.00.03 Remixed ending music and dialogue audio to end the film on Norrington's line "The Heart of Davy Jones"
A tight, to the point edit of the first POTC sequel, smartly edited to pick up the pace and make it a more enjoyable adventure movie. I honestly have to say that at moments I felt like I was watching the original Indiana Jones trilogy, which is sort of on the same level as the original POTC, Curse of the Black Pearl. While the script is not as good and the previos entry, TM2YC smartly removes and rearranges scenes for a full blown action fantasy movie. No cut scene was missed. Unfortunately, we have yet another 2.0 audio track; therefore the usual points are deducted from A/V quality. It's been a few years since I saw the original, but it's testament to how well TM2YC has edited this film that I didn't notice anything missing. In fact, I was nearly at the end when I suddenly remembered "oh yeah, the love triangle is gone." If that's not a statement on a) how well the Editor has structured this and b) how unnecessary that was in the original script, then nothing is. The edit works excellently, with a stirring Indiana Jones-esque feel (especially with the title card overlaying a man painting a map), and the ending is much stronger. By removing certain elements (esp. the aforementioned love triangle; and Jack's "Black Spot" subplot at the start) the story gets going much more quickly, and the characters develop much more strongly here. That being said... the film still isn't a patch on the original, even with TM2YC's excellent work. Unfortunately, this is due to the weaknesses of the script itself. The decision to make two sequels back-to-back means that this film essentially ends halfway through it's second act. There is no meaningful resolution for anyone, and if anything this kind of film might very nicely be turned into a four-part Mini-Series (something to consider...) I think the structure of the plot would suit that much more nicely. But this is a creative thought, nothing to do with TM2YC's edit, which improves on a flawed film as much as possible. As said, any flaws are with the source material, not the Editor's work. I am excited to watch the third episode, which dragged horrifically in the theatrical version. This would easily be a replacement on the original. Dead Man's Chest is a movie that I feel is underrated. It's not as good as the first one, but its better than the mediocre 4 and the terribly disappointing 3. After hearing about these edits, as a POTC fan I quickly downloaded it. Can't say I quickly watched it but after a while I did watch it, and I can say that this is a pretty good alternative. First off, I liked the new color correction, however the sky and sea was too green that it distracted me. While the original was mostly green it wasn't distracting, here it was because I guess getting rid of the other greens higlighted the rest. That being said, it's not terrible. It is good. The quality was great, the editing was flawless. About the narrative, not much is changed, except the 12 minute deleted sequence. I understand why it was cut but in my first time viewer eyes I had many questione in my head like "How did Bootstrap end up in the Flying Dutchman?" or "Where is Jack's hat?" or after the Kraken spits it, "When and how did Jack lose his hat?" The only problem I had with the movie was the love triangle, and how it's gone here is great. Watching the 12 minute sequence is necessary for me. Then the problem I had is gone, but then it's replaced with; "What happened to the black spot?" I know this may be a nitpick to some audiences, but to me it's important. The black spot is for the Kraken, as explained in the sequence. When it is gone after the deleted sequence, it's unsatisfying. Gosh, this was terrific! I never cared much for any of the "Pirates" movies past the first one due to them being over-long, unpleasant to look at, and damn near incomprehensible. I'm happy to say that TM2YC has redeemed this one for me in a big way. The color correction? Perfect. The restructuring and simplification of the plot? Inspired. And it's funny, while one of my major complaints about the theatrical cut of Dead Man's Chest was the preponderance of lengthy, ridiculous action sequences, here they didn't bother me at all! Even though the editor left all of these scenes relatively untouched, the length of these scenes doesn't grate in the same way (at least for me). I think the reason for this is the improved pacing. Since it now doesn't take forever to get through every single scene, and since the plot is so streamlined, these sequences now feel like logically-placed, epic set-pieces instead of just one more thing that's getting in the way and slowing the narrative down. I only have a couple of negative things to say, and they are very minor. 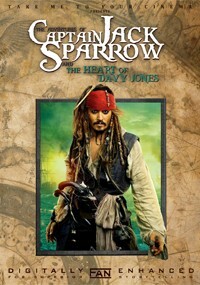 Firstly, for a movie called "Captain Jack Sparrow and the Heart of Davy Jones" the titular pirate feels awfully sidelined. It's not a criticism of the cuts, as they were all well chosen, but since the movie focuses much more on Will and Elizabeth, it's hard to really see this as Jack's adventure. And lastly (yes this really is it), I will echo the sentiment of other reviewers that, while I like the new ending, it does end rather abruptly, meaning the final moment doesn't land properly. All in all, though, this is a very professional and enjoyable edit and a much more worthy follow-up to the first film. I highly recommend watching it, and in the best possible quality for your setup. Let me come right out and say it: POTC 2 and 3 were huge disappointments to me. The first POTC was a great adventure and a fun ride. The following 2 films were stuffed full of pointless and unnecessary action, convoluted, confusing character motivations, and over-the-top visuals and plot lines. What started the series as a "realistic" setting - putting aside cursed gold - quickly turned into a mythological, epic behemoth... of a let down... Why do film-makers think sequels need to be bigger to be better? On to this edit: let's start with the good stuff. Not just good - but great! The audio/video quality was simply outstanding. I forgot how beautiful some of the cinematography was in this film... probably because it wasn't so beautiful until TM2YC color-corrected it! The picture quality was immaculate. I watched this edit with a friend - we both agreed that in terms of editing/cuts, neither one of us could tell this wasn't a theatrical release. No noticeable edit or transition. (from a quality perspective) Quite impressive! Now on to the narrative... I was hoping that TM2YC could make me enjoy this film... but I was disappointed. I probably went in expecting too much, which left my ending opinion sullied. Would it bring someone around that didn't like Dead Man's Chest? Possible... but don't get your hopes up.